Slow progress – Better than no progress? It has been a slow, SLOW go of the redesign for tsn8. Between losing 50 lbs from March to September, and then starting a new job at the end of September, there hasn’t been much time put into writing code outside of work. Hey, it’s [[Oracle]]’s profile! And Bethnangel’s birthday – Happy Birthday! 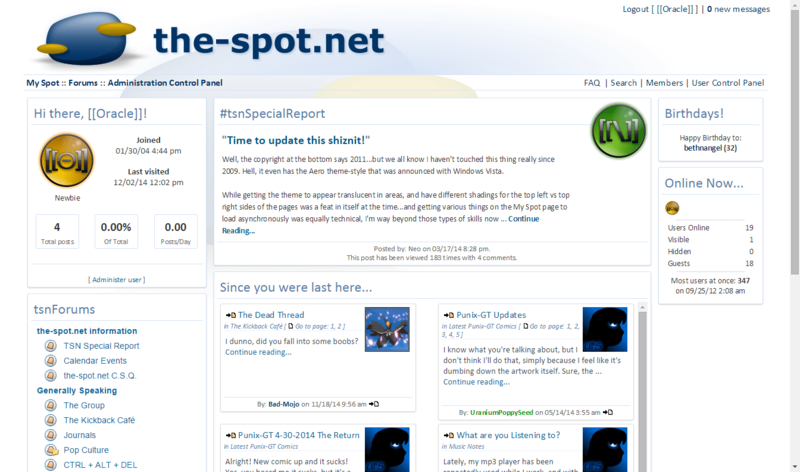 It’s not completely finished, as I’d like to figure out a good spot for @thespotnet twitter feed, and perhaps any other useful social network feed I can get onto the page that won’t look like crap. All the same info is available via the Twitter feed though, so it’ll probably just be that. If you want try it out for real, just head on over to http://tsn8.the-spot.net and give it a whirl – be warned, this is the only page that is intentionally functional. You may notice some things from the screen shot that you might have wished were in the old version, like 5 years ago. The main thing being a scrolling Latest Posts box. Well, you’re in luck – 5 years later. It’s there, and on both sites. Seriously, log into tsn7 and you’ll see the useless stats were removed from the right side of the page (oh, you didn’t notice?) and the Latest Posts box now has an overflow check to give you the first ~500 pixels of content before scrolling. Now the page isn’t 7 miles long for someone who isn’t signed in. There’s also a lot more meta information in the Latest Post cards, like easily identifying who made the post, what the first part of it says, and where/when it was made. Now you can read it all in the card if it’s not that long, or continue reading at the post itself. OMG, it’s so white. There’s a faded tsn logo in the background – at a calculated position – that stays there and serves as a simple color breakup for the initial focal point for the eye when the user views the page. After that, the eye wanders to other parts of the page where the content takes over, and the background fades away. There really was no reason for this information to take up a whole row of the primary content column on the page. I consolidated the Online Users list into their Avatars, instead of their usernames, and stacked the online-user-type counts & stats to fit it all into a neat little box. Well, there are still some things I’d like to add to the page, and moving the Stats and Birthdays to the right-side really opened up some space at the bottom, and next to the Latest Posts. But I just don’t have anything to put there specifically. So while this will likely look a little different when it finally gets pushed out to the actual site, for now I will turn my attention to what has become a hideous forum index; my change in font-size has caused some text to get out of control with stacking, relative size values.